Pam at Digging has a new meme going that celebrates foliage and other non-blooming natural things around the yard, the day after Carol's Garden Bloggers Bloom Day. While photographing my yard for blooms (my Bloom Day post is here), I had great fun in photographing the many interesting textures and colors in the garden. I think this might be the last hurrah for my 'Bloodgood' Japanese Maple above, but a nice hurrah it is. I wish I had thought to put something at the base of this pine tree so you could tell how massive it is. 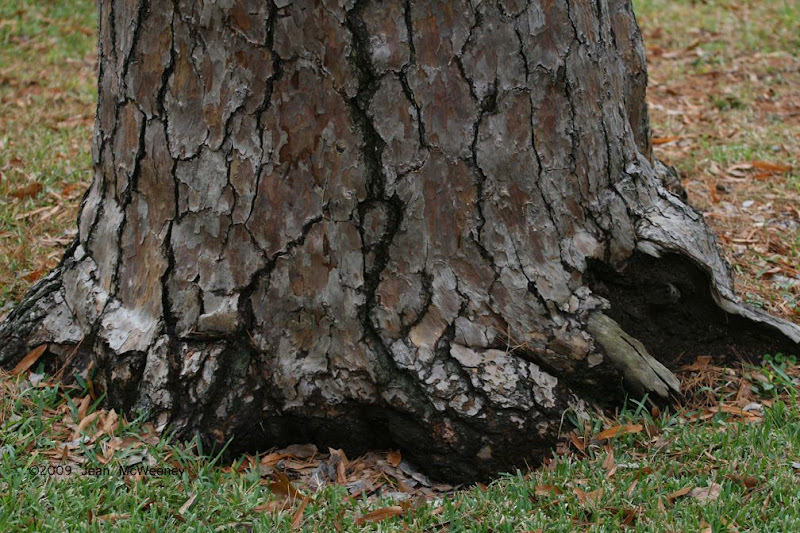 When I hug this tree (yes, I do that occasionally), I can't get my arms all the way around. I wish I knew the variety of pine it is (might be Short Leaf pine since it has very short needles). 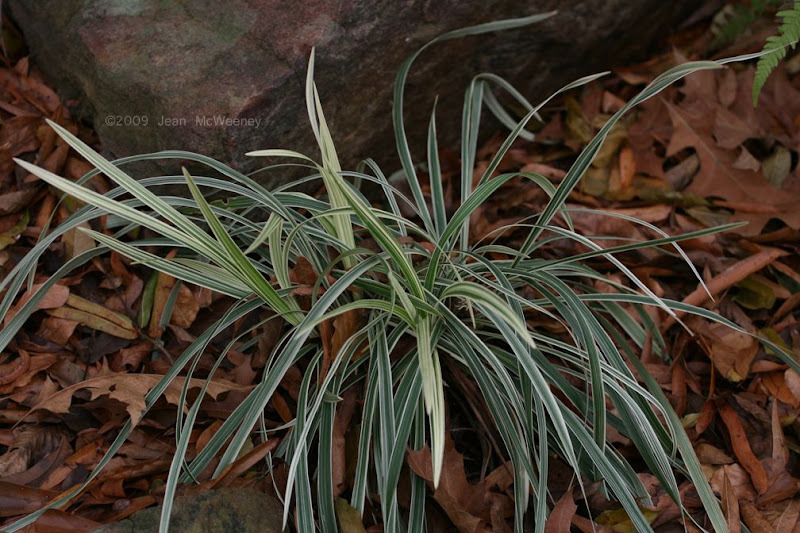 This time of year is when the ‘Silver Shower’, Ophiopogon jaburan, a type of mondo grass, starts putting on new growth. Seems a strange time for it but that's what it does. I have several of these in mostly shade. The foxtail ferns (Asparagus meyeri I think) are in large pots nestled against the house. I'm too scared to leave them out exposed where I normally have them most of the year. I probably don't have to worry though. They're very hardy. 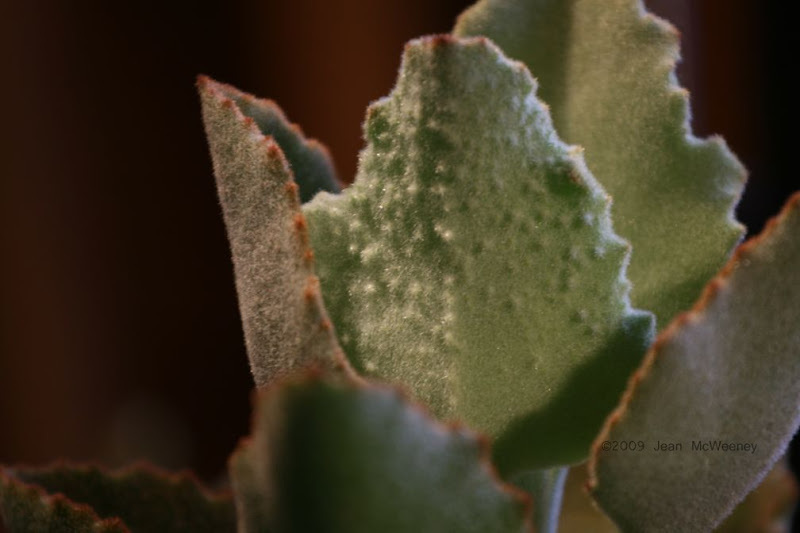 The texture on my ‘Felt Plant’, Kalanchoe beharensis, is like velvet. Although this photo is towards the top of the plant, the older leaves show more bumps on their undersides. 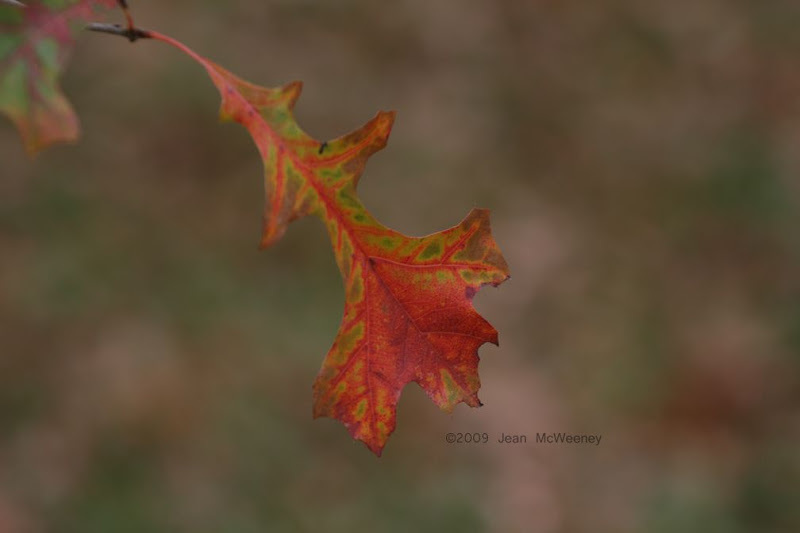 I like the way my red oak is still determined to hang on to some of its chlorophyll. Moving to a more ancient form of vascular plant, we have Horsetail Rush, Equisetum hyemale. 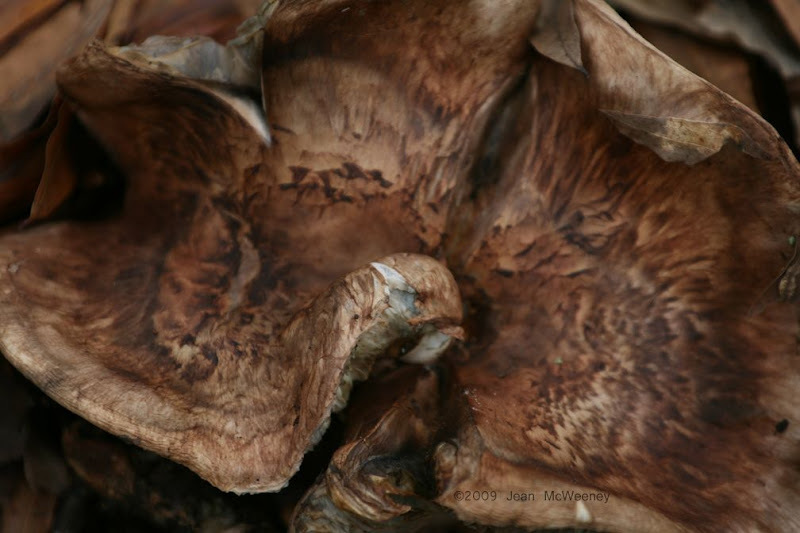 (It's ancient because it reproduces by spores, not seeds.) This is in a pot in my little water fountain. So far I haven't had to protect it from freezing yet. I really don't mean for this to be a botany lesson but now I seem to have moved to non-vascular plants like this moss (the black stuff is mold, green stuff is moss). This appears during the rainier seasons on our chimney. And now I've moved to lichens, which according to Wikipedia is "a symbiotic association of a fungus (the mycobiont) with a photosynthetic partner (the photobiont or phycobiont), usually either a green alga (commonly Trebouxia) or cyanobacterium (commonly Nostoc)". Plus a little moss thrown in on the rock for good measure. 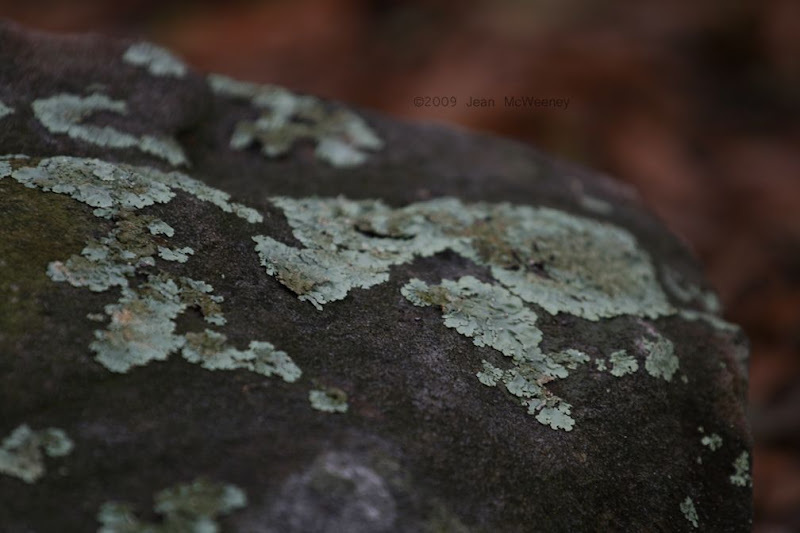 More lichens and rock. The only native rock around here is something called "iron ore", so these rocks come from Arkansas. Makes me feel a bit guilty that they're not native but iron ore is usually small, rusty, and hard to work with. I guess I'll end my impromptu romp through the plant kingdom with a fungus, some type of big mushroom. Be sure to check out the links to other Foliage Follow-up posts at Pam's (and my Bloom Day post if you haven't seen it yet)! Jean, I love that you included moss, lichen, and 'shrooms in your foliage parade. That moss on brick image is particularly cool. And wow--that 'Bloodgood'! Thanks for participating. 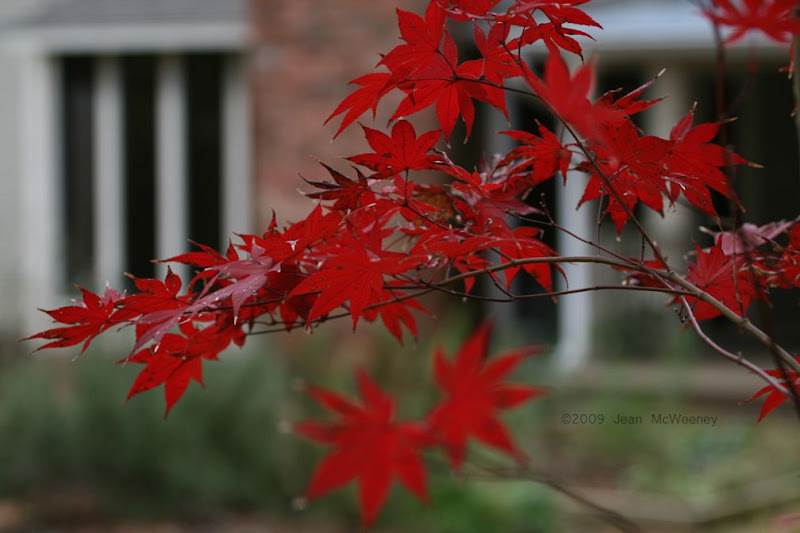 I love the Japanese maple. I'd really like one. Just don't know how the deer would treat it. The moss and lichens are interesting. I noticed some here, just didn't think to include them. That could be the only thing worth photographing, next month. Jean, I can't decide which shot I like best. 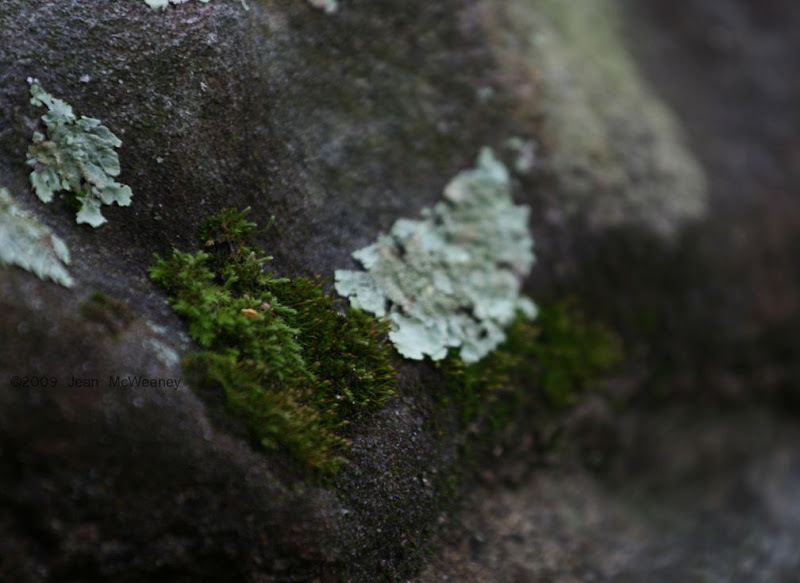 You've proven yourself a kindred spirit: I'm always stopping to admire moss and lichen. They fascinate me. I love this post--your photos are wonderful. What a great idea for foliage and textures! I love the wide variety of images you chose. They're all just beautiful. 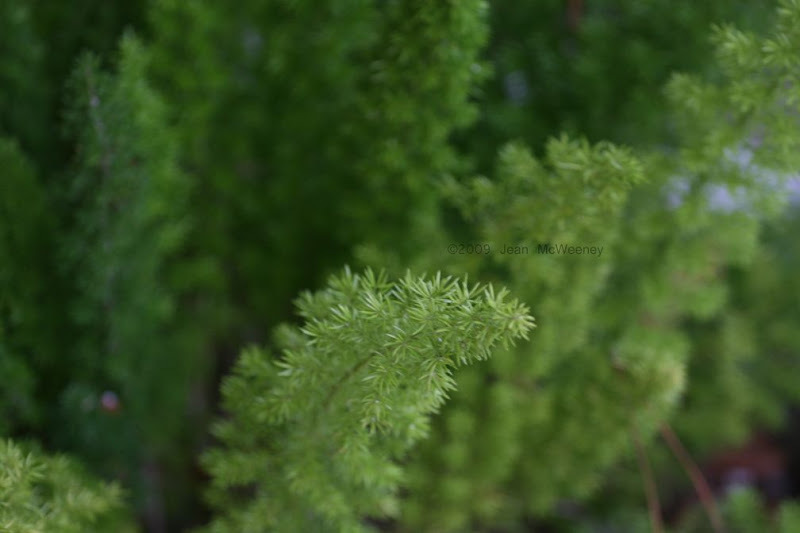 I'm just crazy about your Horsetail Rush photo! Beautiful photos....I don't know which one is my favorite! So nice to see close up views, to really get the details. Jean, this post was every bit as enjoyable as your GBBD post. So glad I didn't miss it. The trunk of your pine tree is very impressive and I'm not surprised that you're a tree hugger....that's a compliment, by the way. I often hug my shrubs and fluff them up to let them know they're loved. Never thought about including the trees. I noticed a lot of foxtail ferns in San Diego last week. The felt plant is new to me, but I like it. 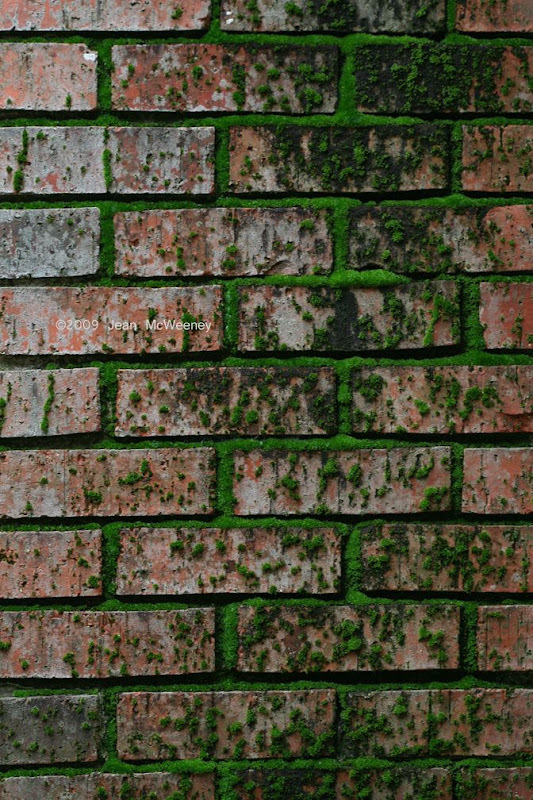 My favorite photo is the brick chimney with the moss and, yes, even the mold. what a picture your J maple makes and all the other photos. The lichens mosses and fungus all all color and texture to the garden and we should give then their due. Nice post. Gorgeous photos, Jean! You make even a lowly fungus look good:) Love the picture of the moss on the chimney. This is such a cool idea, and your pictures are amazing! I especially like the foxtail fern. I love the botany! The photos were lovely, and I am enthralled with that 'Bloodgood.' I think I must have a Japanese maple for my shrub choice. Thank you all for your kind comments. I've been under the weather (one of those horrific winter colds) so I haven't been able to make it to all your blogs. But hopefully I will before Christmas as I'm finally on the mend! Love your photos. I've add to your site to my blog roll on Southernpost.net - Thanks for sharing these. Hope you're feeling better, by now. And, hope you aren't getting that severe weather. Have a wonderful, safe Christmas.